Established in 1952, St.LukesHealth is a non-profit organization committed to providing private health insurance to members across all States and Territories of Australia. A large network of offices and agents are located throughout Tasmania offering personalized service on a comprehensive range of electronic and online services to some 55,000 citizens. Striving to keep their healthy members healthy, St.LukesHealth desired a cutting edge solution to engage and attract these members and enhance their health literacy through an interactive portal. Additionally, facing rapid claims growth and an increase in the prevalence of chronic disease among its members, St.LukesHealth sought to turn members into partners and make them the center of their own healthcare. 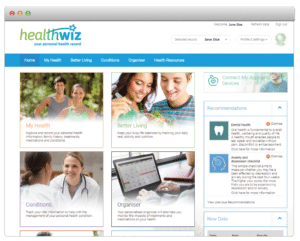 Its goal was to reduce readmissions and avoid unnecessary events by providing members with tools to connect with their health data, share their health data and use that data to better coordinate services. Get Real Health was engaged to create a solution, Healthwiz, as part of St.LukesHealth’s larger Individual History of Health (iHoH) initiative. Get Real Health utilized its CHBase and InstantPHR platforms as the core of the solution with key integrations and enhancements to meet client needs. 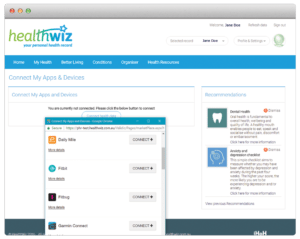 Validic, a Get Real Health partner, provided the integration tool to make data from fitness apps and trackers readily available in Healthwiz. A single sign-on was necessary to improve usability and maintain engagement over time. The final solution featured a bi-directional flow of data that captured not only clinical data but alternate sourced data like patient generated readings into one single location. St.LukesHealth conducted targeted focus groups to ascertain what features would be necessary to achieve patient engagement over the lifespan of an individual, with the hope that this knowledge would direct positive behaviors in both healthy and chronically ill patients. Providing a wealth of data in one place, with one sign-in, was the first step to engaging patients and reducing claims over time. This solution marked Get Real Health’s first engagement with a payer, or health insurance provider. This solution showed the value of not only CHBase and InstantPHR but of our strategic partners as well, in creating viable solutions across the healthcare spectrum.